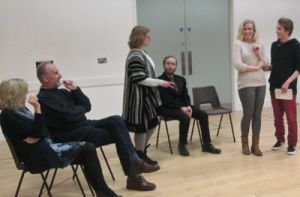 In the depths of winter, Husthwaite Village Hall is preparing to present a taste of summer with their production of Noel Coward's play Hay Fever. Director Lottie Alexander has brought together a cast of Husthwaite residents and some players from further afield. Returning from their roles as Baron Hardup and his wife Lady Devilia in the pantomime, husband and wife team Euan and Liz Crawshaw have been cast as the bickering couple David and Judith Bliss. A dramatic role reversal sees John Law swop from Ugly Sister to the elegant diplomatist, Richard Greatham, and Anne Dowson changes from bailiff to housekeeper, Clara. Sheila Mowatt is making her acting debut as the femme fatale, Myra Arundel. Joining these regulars are some actors new to Husthwaite drama who are travelling quite some distance take part. Lizzie Dimouli from Ampleforth has been a professional singer and dancer and is taking on the role of the timid Jackie Coryton. Thomas Jennings, a professional actor, is from Malton and plays Sandy Tyrell. Ned Murray and Natalie Scurr who play the Bliss's bohemian children, Simon and Sorel, travel from Middleham and Leyburn. Together they all gel to create a harmonious team for this hilarious play of bad manners. Hay Fever was based on an experience Noel Coward had in the 1920s when he stayed at New York the home of a producer and his actress wife and spent a weekend with guests being ignored, abused and abandoned. The play was first staged in 1925 and has hardly been out of the theatrical repertoire ever since - at any one time there can be up to a dozen productions being performed somewhere in the world. So let us put a little sunshine and laughter into your winter.